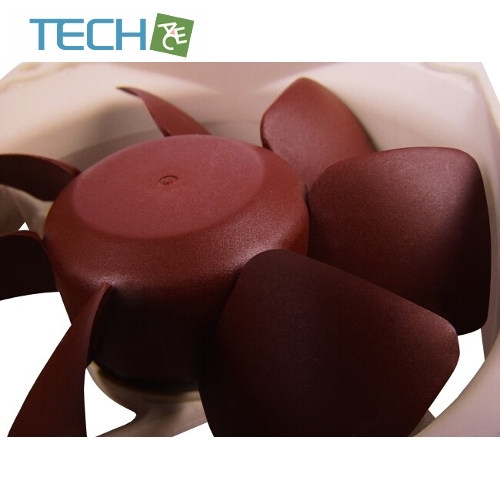 Current silent fans frequently employ conventional blade geometries, which were developed for higher speed ranges and significantly lose efficiency at lower rotation speeds. 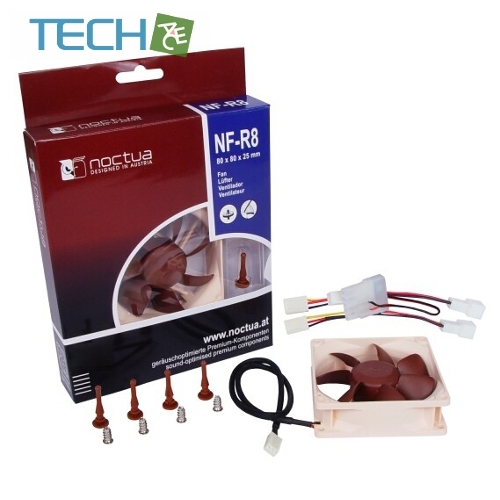 The Noctua Raised-Blade-Design of the NF-R8 series was developed by the Austrian Institute for Heat-Transmission and Fan Technology (Österreichisches Institut für Wärmeübertragung und Ventilatorentechnik, ÖIWV) and specifically tailored to 80mm fans with extremely low rotation speeds. The result is a performance improvement of up to 10% compared to conventional blade geometries. Both the angle of attack and the design of the blade area of the NF-R8 rotor are optimised for maximum airflow and minimum noise emission at speed ranges below 1800RPM. Raising the leading edge above the rotor hub and lowering the trailing edge below the bottom of the rotor hub results in an extended profile chord length, which compensates for the reduction in blade surface caused by the steeper angle of attack and hence increases the overall blade force. The continuous radial increase of the blade curvature towards the blade tips ensures sufficient static pressure despite of the slow rotation speeds. A significant reduction in noise emission is achieved through the rounding of the fan blades towards the rotor hub as well as the rounding of the rotor hub itself. This way, the NF-R8 is significantly more quiet than other high end silent fans at the same performance thanks to its specific optimisations for ultra low noise application. 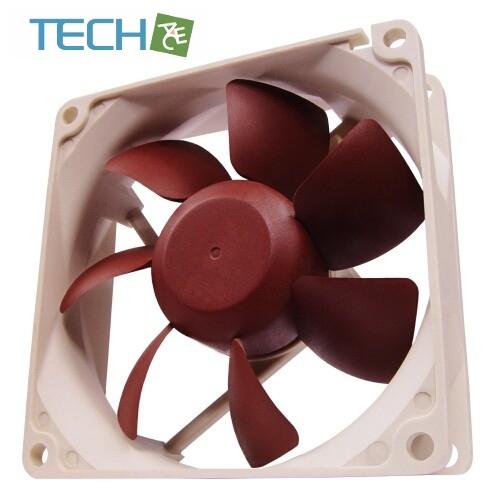 "In the area of PC cooling, the last years saw a growing demand for axial fans with the lowest possible noise emission, which manufacturers mostly met by simply reducing the RPM of existing models without sufficiently adapting the blade geometry and profile to the modified fluid dynamic parameters. The comparison of measured data and simulation outputs showed that the result was an average deficit of efficiency of 10-15%. The complete redevelopment of the blade geometry and profile was carried out with exact fluid mechanical adjustment to minimal noise emission in a speed range of 400-1800RPM at a height of 25mm and a radius of 40 and 60mm. Both fan blades possess 8-12% more flow rate than comparable products at the same total noise emission and static pressure." (Mag. Manfred Stadler MBA, Austrian Institute for Heat-Transmission and Fan Technology (Österreichisches Institut für Wärmeübertragung und Ventilatorentechnik, ÖIWV)) Self-stabilising oil-pressure bearing (SSO bearing): The NF-R8 series are equipped with a magnetically centred, self lubricating oil-pressure bearing that provides a new level of quietness and long-term stability.